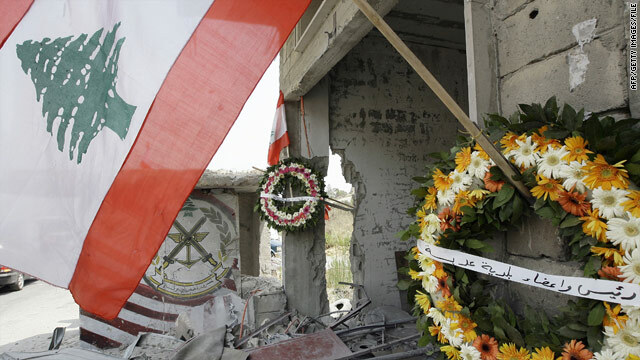 A Lebanese flag and wreaths at the spot where two Lebanese soldiers died in a firefight over tree cutting. Beirut, Lebanon (CNN) -- The Lebanon mission to the U.N. has told CNN in a written statement that the Israeli Military "ignored a request by the LAF (Lebanese Armed Forces) and UNIFIL (United Nations Interim Force in Lebanon) to postpone cutting down trees in a contested area along the "Blue line", the U.N. border line demarcating Israel and Lebanon. The statement goes on to say: "The LAF fired warning shots asking Israeli soldiers to desist from their activities. However, the Israeli response came in the form of heavy gunfire and mortar shelling of three Lebanese villages killing one journalist and two Lebanese soldiers in addition to wounding six soldiers." While Lebanon acknowledges Israel made proper notification of its tree cutting plans through proper U.N. channels -- by advising UNIFIL the work would commence -- the statement says the Lebanese Army was only informed of the plans 15 minutes before the work actually began and slams Israel for not "respecting" the "tripartite coordination" by preventing the Lebanese from requesting a delay on the work in the disputed area. The document provides details about the firefight. The Lebanese mission says that 10 soldiers were immediately dispatched after hearing the IDF would begin work within minutes "to protect its sovereign borders from any Israeli infringement." It was presumably these soldiers who fired the "warning shots." A heavy and prolonged firefight on August 3 cost lives on both sides: three Lebanese and an Israeli officer were killed in the skirmish. Israel has consistently maintained that it bears no responsibility for the deadly border fighting and that its soldiers were operating on sovereign Israeli territory -- a claim backed up by the U.N. who confirmed that Israel did not cross the Blue Line into Lebanese territory. While both sides have pledged to work closely with UNIFIL to prevent another outbreak of violence the Lebanese statement comes after questions were raised in Washington about U.S. funding of the Lebanese Army. The border clash and resulting diplomatic saber rattling have lead some U.S. politicians to question the wisdom of arming a military that has been engaged in fighting with the United State's closest regional ally. Thus what has been a regional policy issue has been thrust into the Washington "beltway" of domestic politics. Earlier this month members of the House of Representatives put a hold on funding for the Lebanese military. U.S. military aid to Lebanon has served a number of foreign policy objectives. Arming the Lebanese military has been seen as a way of offsetting the heavily armed Hezbollah militia in the south and also allowing the government in Beirut to stand-up to the threat of Sunni insurgents operating in Palestinian refugee camps. In a deadly three-month long conflict in the summer of 2007 the Lebanese army defeated insurgents in the Nahr al-Bared refugee camp. Fatah al-Islam, the main group fighting the army from inside the camp has been accused of having past links to al Qaeda and Syria. But in a twist of policy and fate it is now the Lebanese military and the Syrian and Iranian backed Hezbollah standing side-by-side along the southern border. Speeches of "unity" and "praise" for the Lebanese Army from Hezbollah's leader Sheik Hassan Nasrallah have followed the clash, along with a series of speeches rattling the cage of the international tribunal investigating the assassination of former Prime Minister Rafik Hariri. Nasrallah's recent accusations of Israeli involvement could prove a clear indication that the many attempts by different powers to split the Lebanese Armed Forces from Hezbollah have simply not worked. As Hezbollah finds itself for the first time in Lebanon taking a military back-seat, Lebanon's Defense Minister Elias Murr has announced a bank account aimed at attracting dollars from Lebanese living abroad -- to fund the army supposedly without U.S. assistance. While some in Washington are discussing cutting off military aid completely some officials in Beirut are talking about turning down aid if it comes with conditions. The United States' policy of arming the Lebanese Army may have, in part, been predicated on a Hezbollah defeat in the recent elections and the assumption that the country would be experiencing a greater level of domestic political discord further alienating the army and Hezbollah. But through various moves and speeches made by Lebanon's leaders a divide between the two does not seem to be the case and public rhetoric of late has pointed to exactly the opposite. Hezbollah and the Lebanese Army are being hailed as single and unified fighting force committed to the defense of the country. Whether or not recent events have really helped to bridge the gaps that have separated the Lebanese military and Hezbollah remains to be seen, but Israel is now eyeing its northern border with a renewed sense of vigilance with the prospect of squaring off against a seemingly more unified enemy.